Charlevoix can be a busy place, especially in the summer. But just north of the city, tucked behind Mount McSauba, is a small preserve where it’s easy to escape the crowds of tourists. 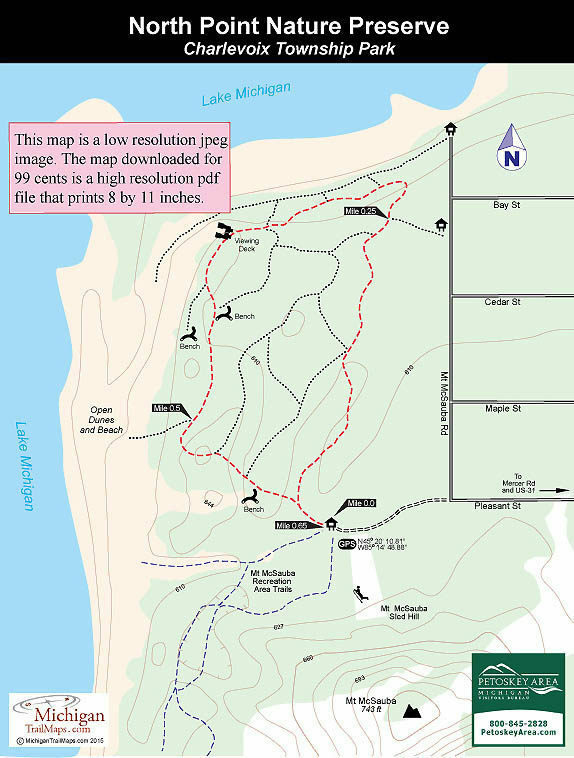 North Point Nature Preserve is a 27-acre tract that includes wooded and open dunes, forests in various stages of succession and 2,800 feet of shoreline on Lake Michigan. The small preserves was purchased in 1988 in an effort spearheaded by the Little Traverse Conservancy that included applying for a grant from the Michigan Natural Resources Trust Fund and organizing a local fundraising campaign. 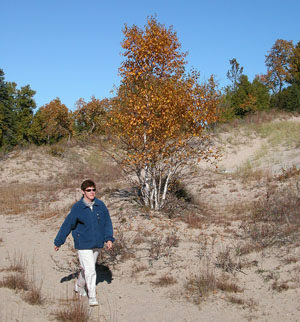 The land was eventually deeded by the Little Traverse Conservancy to Charlevoix Township as a public nature preserve. North Point not only contains a stretch of undeveloped lakeshore in the middle of this tourist town but three threatened plant species as well: Pitcher’s Thistle, Lake Huron Tansy, and Pumpell’s Bromegrass. Despite being on the edge of a city, the preserve also harbors deer, porcupines, various shore birds and occasionally loons, eagles, and great blue herons. The preserve lies adjacent to the Mt McSauba Receation Area, a 50-acre park that is dominated by its namesake dune and is the focal point of a city-operated downhill ski area. The recreation area also has a limited network of trails that merge into those with the preserve. The 1.5 miles of trails at North Point are poorly marked and at times seem to be haphazardly laid out but it would be nearly impossible to get lost here. Walk 10 minutes in any direction and you arrive at either a road or Lake Michigan. The route describe below is a 0.65-mile loop that is composed of the best defined trails and is easy to follow. The primary activity at the preserve is hiking. In the winter, cross-country skiers and snowshoers use the trails when there is sufficient snow. Within North Point there are two trailheads along Mt. McSauba Road. This loop begins at the sled hill in Mt McSauba Recreation Area. From Mt McSauba Rd head west on Pleasant Street where it becomes a dirt road and ends at a parking area. Three trails depart from here, including a wide path that heads due west to Lake Michigan. The trail into the preserve is well marked with a large display map, courtesy of a boy scout working on his Eagle project. You enter the woods to quickly reach a junction, head right to follow the loop in a counter-clockwise direction. You pass two trails heading west (left) into the interior of the preserve and then at Mile 0.25 a trail heading east (right) to a trailhead and small parking area along Mt McSauba Road. Just beyond the junction the loop swings west where views of Lake Michigan pop through the trees and shortly arrives at a series of wooden steps climbing a wooded dune. At the top is an observation deck with views of open dunes, Lake Michigan and a cement plant on the other side of the bay. From the deck it’s possible to descend into the open dunes along Lake Michigan. This loop continues by heading south (left) along the crest of a foredune for more views of the bay. Within 100 yards the trail descends back into the wooded interior arriving at an intersection with a bench. Head right and at Mile 0.5 the loop passes another spur leading west to the shoreline. 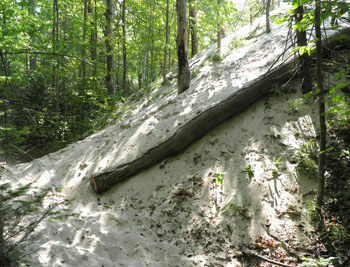 At this point the loop climbs over a dune and descends to intersection at the backside of a dune whose sand is pouring through the trees. Strategically placed here is an old bench. The loop continues its southwest direction to quickly arrive at the first junction and then the sled hill parking area. Other than a parking area and a display map, there are no other facilities at the trailheads. North Point Nature Preserve is open year-round. There are no vehicle or entry fees. From US-31 on the north side of Charlevoix turn north on Mercer Rd and then west (left) on Pleasant Street. You cross Mt. McSauba Road just before Pleasant Street turns into a dirt road and end at the Mt. McSauba Recreation Area sled hill. Turn right on Mt McSauba Road to reach the other two trail heads.